Rouen ducks - giant mallards - originated in France. Harrison Weir (1902) commented that 'they are merely the wild duck enlarged by domestication and high feeding'. The French know them as Rouen fonce (dark) as opposed to the Rouen Clair, which are lighter-coloured birds with one different colour gene (light phase instead of dark phase). Good Rouen have come a long way from the mallard. They are imposing birds reaching 12lbs in weight - which is heavy for domestic waterfowl. Although they have a massive body, they plod around quite easily as long as they are kept where they get plenty of exercise on grass, and with a pond or shallow stream. Exhibition ducks have brilliantly coloured plumage in sunlight. They are a rich, warm brown described as almond or chestnut. 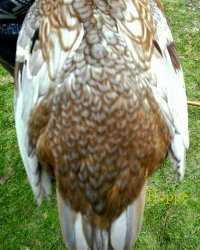 Each feather is delicately marked with a darker line, or double or even triple lines on the larger feathers. They are much more intricately marked than the wild mallard duck. Blue Rouen have now been produced in Germany by Mark Hoppe (see photos at the bottom of the page). The drakes have the brilliant green head and white collar of the mallard, but the body feathers are a bit darker, and should lack any white feathers on the flank as it approaches the tail. Once kept as a table bird, the real Rouen is not suited for this purpose today. They are relatively slow growers compared with the white commercial ducks which have been developed for the table. Rouen do take a year and a half to reach their full size. The ducks are not great egg layers- they cannot compete with the small, light ducks. The amount they lay depends on the strain. Production Rouen, which do lay more eggs, are not the same as the massive exhibition birds. 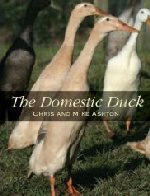 The Domestic Duck is now out in paperback. 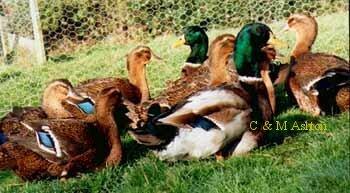 Information on the Rouen and other duck breeds. Blue Rouen have been bred by Mark Hoppe in Germany. 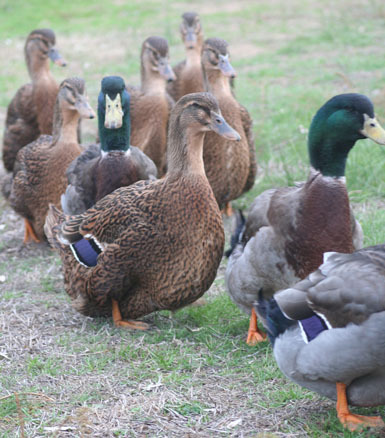 The blue gene has been introduced to the basic mallard pattern, so that these Rouen now follow the same colour series as the Mallard Call duck and Blue Fawn Call duck. An 'Apricot' Rouen could also be produced. Like the Apricot Call duck, this would be homozygous blue.